It's a beautiful East Van neighbourhood, of course. It has spectacular tree-lined streets of heritage homes, Vancouver specials, walk-up apartment buildings, condos and co-ops. Grandview Woodland has fantastic independent shops & cafes too, on Commercial Drive and on Hastings. But really it's the people in Grandview Woodland who make it great. They're an eclectic bunch from all walks of life, who've found an accepting home here. And together they've built strong community organizations, amazing neighbourhood events and continue to help make the city better. They're really fun too. Dan got hooked on garage sales early. Growing up in Ottawa he couldn't wait for the annual neighbourhood sale. He was particularly excited to sell all his old toys and replace them with new ones from the kids down the street. He also ran a mean lemonade stand. 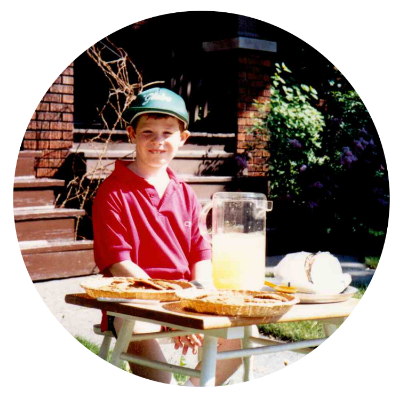 Now a new dad living in Grandview Woodland, Dan's been yearning for a chance to relive his childhood memories, and share the extraordinary neighbourhood-wide garage sale experience with his son and his amazing community. He's also got a whole bunch of stuff he wants to sell. Kate, Val and many others have been organizing a large multi-family yard sale in Grandview for years. Their sale started as a way to bring together residents who'd been having heated debates about traffic calming. Over a decade later their sale has become an annual tradition all their neighbours look forward to. These garage sale fiends joined forces in 2014, and so greatgrandview.ca was born. And the biggest thanks of all to all of the many volunteers who've helped make this happen over the years. They are the ones creating community!